During the first year of your baby's life, every day is an adventure. From baby's first smile to his first steps, there are hundreds of special moments you will want to document. Assembling a customized baby scrapbook is a wonderful way to create a keepsake from this time in your child's life. As a sleep-deprived new parent, you may think the selection of supplies available at craft stores such as Hobby Lobby and Michaels seems intimidating. Fortunately, you don't need to buy all of these items to start making a baby scrapbook. Creative layouts can be made using just a few basic supplies. Stickers, rub-ons, charms, and chipboard embellishments are fun to look at, but these items aren't necessary for the beginning scrapbooker. Many of your baby scrapbook layouts can be decorated with memorabilia such as ribbons from the gifts at your baby shower or fabric scraps cut from some of your child's first outfits. Plan to purchase embellishments for your baby scrapbook on an as-needed basis. If you don't want to purchase your scrapbook supplies individually, buying an all-in-one baby scrapbook kit is an option to consider. Kits include everything you need to make an album, including supplies for baby boy or baby girl scrapbook themes. Depending upon the manufacturer of the kit, the cost may be lower than buying items separately. 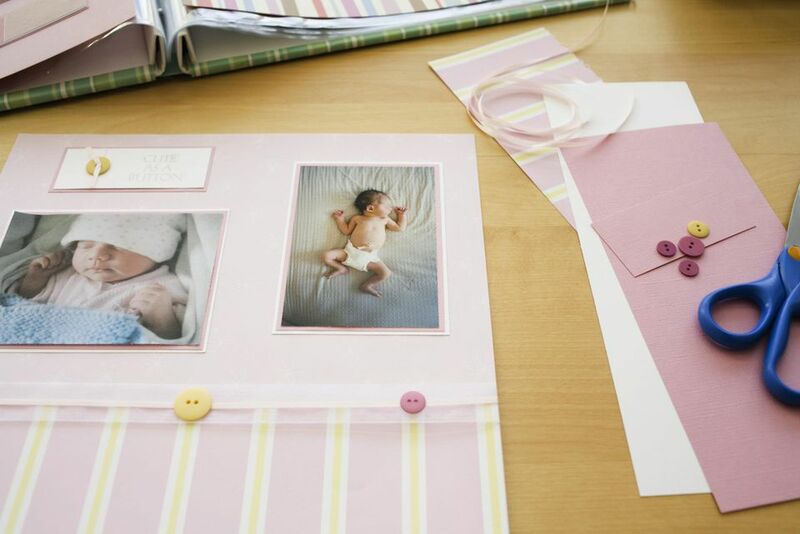 You'll have less flexibility when creating a baby scrapbook using a kit, but the added structure may make the project seem more manageable if you're pressed for time. When starting your baby scrapbook layouts, don't overlook the value of online resources. Websites offering free clip art are a good source of accents for your baby's scrapbook. Free fonts can be used to dress up your favorite baby scrapbook sayings for page titles, photo captions, and journaling. Digital scrapbook freebies can be printed onto acid-free cardstock and cut apart to use like your favorite traditional scrapbook supplies. Staying organized is the key to making great baby scrapbook layouts. Many new parents find it is most effective to assemble page kits for each layout in their album. File your photos by the month they were taken, then add a note card with key details from each event. Place the photos and any coordinating cardstock, patterned paper, and embellishments you wish to use in a large envelope. When you find a few free moments to work on your scrapbook, all you'll need to do is grab an envelope and start creating. If you're having trouble deciding how to arrange your photos on the page, consider printing a few scrapbook sketches to use as a reference. Sketches are diagrams that show where to place your photos, page titles, embellishments, and journaling. The magazines Creating Keepsakes and Scrapbooks, Etc. both feature scrapbook sketches each month, but you can also find a nice assortment of free sketches online at Becky Fleck's Page Maps website. Here are some important baby development milestones that you can document in your scrapbook. This layout will help make your baby scrapbook an accurate reflection of your child's first year. Bringing home a new baby provides many opportunities to take pictures for your scrapbook. You’ll likely be too tired to create a baby scrapbook layout immediately, so jot down a few notes that you can refer to at a later date. You may also want to have other family members write a few words about bringing home a new baby that you can use to supplement your own journaling. When do babies start smiling? New parents aren’t always sure, but as a general rule of thumb most infants can smile socially at between six and ten weeks of age. These cute smiles are sure to be the subject of many baby smile scrapbook pages. Remember to zoom in with your camera to get the full effect of that cute baby smile. Your child rolling over is an important step in the process of him learning to walk. Celebrate this occasion by making a layout that captures his sense of accomplishment. Include multiple pictures to help capture the action of your child rolling over. Starting baby on solid foods provides plenty of cute baby scrapbook page ideas. From bananas to strained peas, a baby eating solids tends to have very definite opinions on what foods he likes! Try to get pictures of your baby eating some of his favorite foods, as well as shots that showcase his reaction to foods that weren't a hit. If older siblings are around to help feed the baby, these pictures can be good additions to a starting baby on solid foods scrapbook page as well. A crawling baby loves to cause trouble! Despite your best babyproofing efforts, your little one will probably still manage to cause some mischief. Keep your camera handy so you can take lots of baby photos for your “Baby Start Crawling” scrapbook page. Baby’s first tooth gives his smile a new look, which creates a chance to reflect on how much he has grown in such a short time. You’ll also have some special infant teething memories to include on this page in your baby scrapbook album. Of all the important milestones baby reaches during the first year, sleeping through the night is the one that exhausted parents tend to be the most eager to celebrate. Once you’ve figured out a good baby sleep schedule, scrapbook what tips worked best for developing a productive bedtime routine. If you're not done adding to your family, you may need these sleeping through the night tips at a later date! After his first haircut, your baby will look more like an active toddler than the sweet little newborn you look home from the hospital. Remember to take plenty of pictures for your baby's first haircut scrapbook page. If you practiced giving your child a pretend haircut to help prepare for the experience, you may also want to include these pictures on your baby's first haircut layout. There's no strict timeline for learning to talk, but most babies stay their first words around one year of age. Learning to talk is an important baby development milestone since it allows your child to better communicate his needs. Thanks to modern technology, you can now even include a recording of your child's voice on your "My First Words" scrapbook page.